1University of São Paulo, São Paulo, Brazil; 2Federal University of Rio de Jane iro, Rio de Janeiro, Braz il. 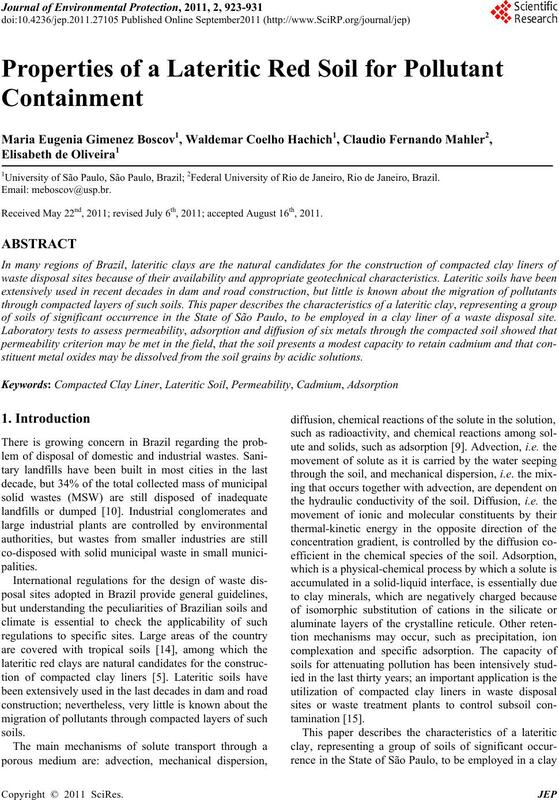 Received May 22nd, 2011; revised July 6th, 2011; accepted August 16th, 2011.
of soils of significant occurrence in the State of São Paulo, to be employed in a clay liner of a waste disposal site. stituent metal oxides may be dissolved from the soil grains by acidic solutions. the State of São Paulo . group and iron and/or aluminum oxides and hydroxides. Figure 1. 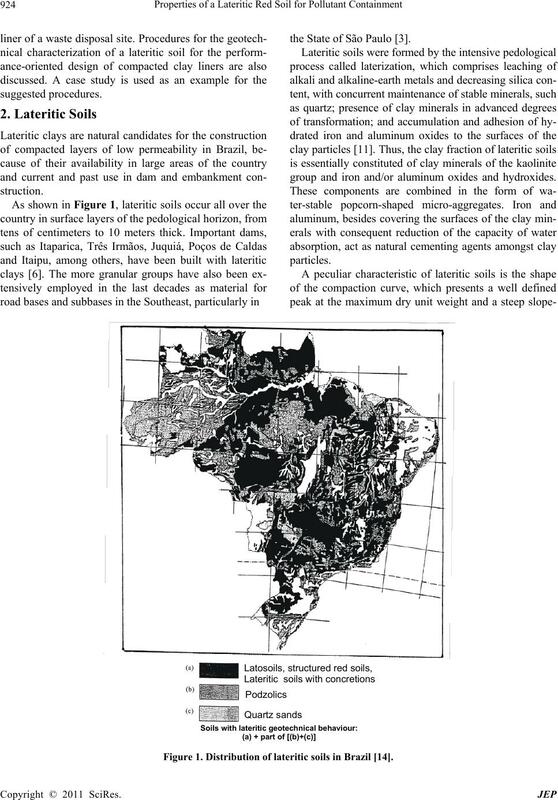 Distribution of lateritic soils in Brazil . layers fairly ho ri zont al and t he water table high. are quartz, nacrite, kaolinite, gibbsite and hematite. flocks of around 0.01 mm diametre. water, respectively, were needed to reach equilibrium. dmax at st andard Pr oct or ene rg y ). for hydraulic gradients varying from 10 to 40. Figure 3. Permeability test with varying confining pressure (c) and hydraulic coefficient (i). Figure 4. 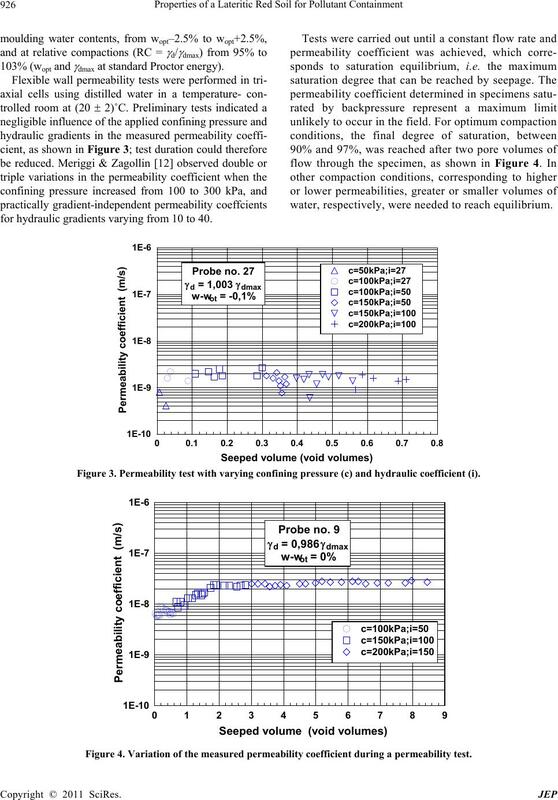 Variation of the measured permeability coefficient during a permeability test. regulations) of each metal separately. through the soil, driven only by a concentration gradient. fluid reservoir to monitor the solution composition. since this metal was not present in the initial solution. and zinc. Tests were again carried out with method B, i.e. tion ratios but different initial concentrations. 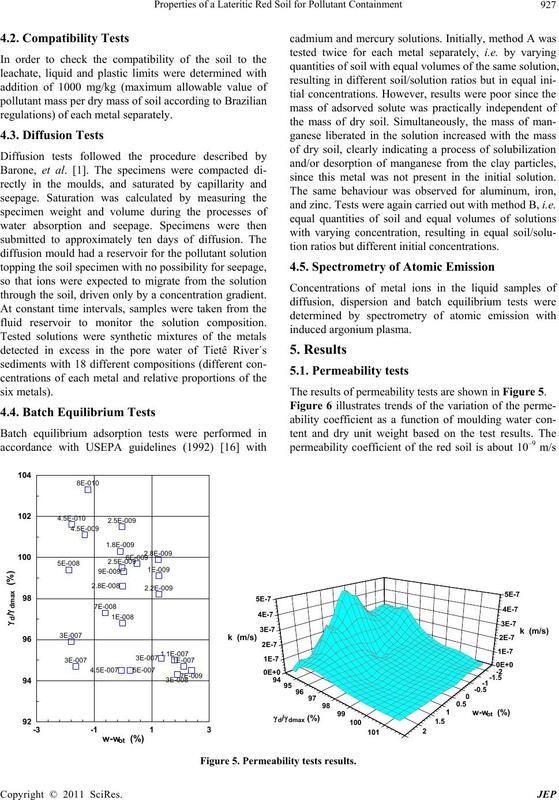 The results of permeability tests are shown in Figure 5. Figure 5. 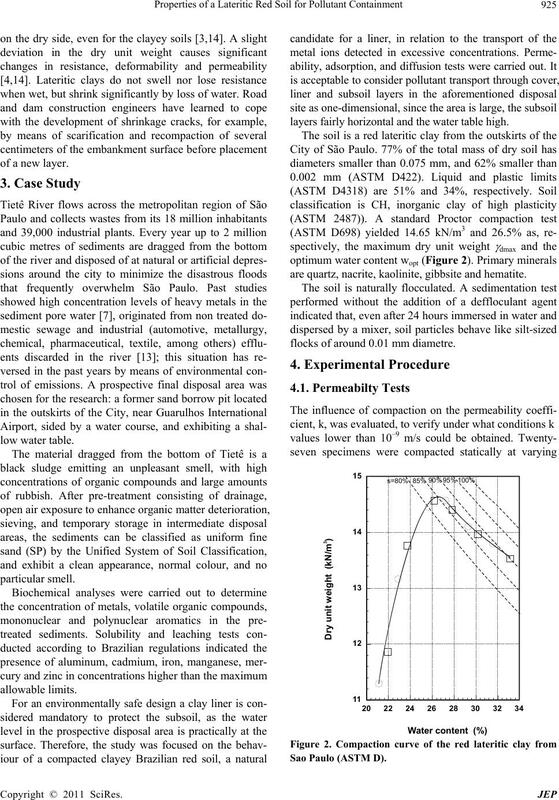 Permeability tests results. content and dry unit weight. plained by the porous microstructure of lateritic soils. crease cracking by differential settlement. meability is the rule fo r compacted soil layers . wL and wP increased by the same amount. 8 was verified in 32 different tests. currence of dissolution phenomena due to the acidic pH. Figure 7. Atterberg limits with addition of metals. Figure 8. Aluminum concentration in the fluid reservoir. Figure 9. 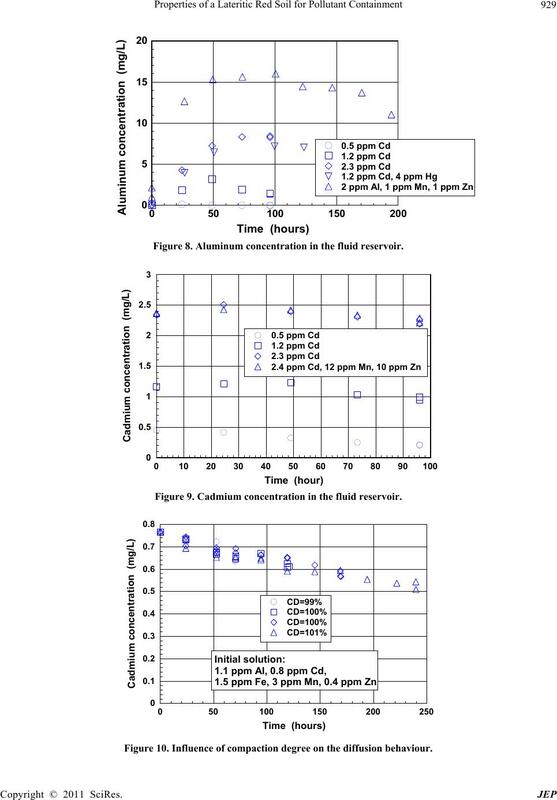 Cadmium concentration in the fluid reservoir. Figure 10. 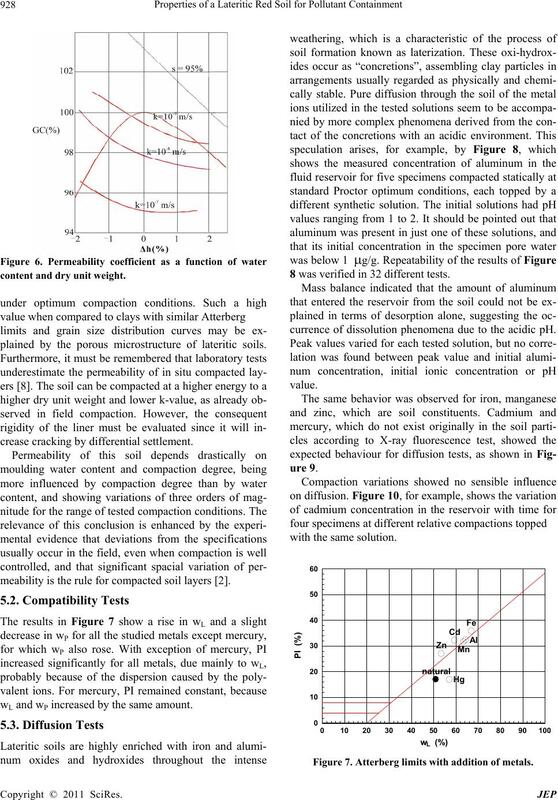 Influence of compaction degree on the diffusion behaviour. fluorescence tests and scan electron microscopy tests. after days of contact with a metal solution with pH 2.
ides was removed from the soil. Figure 11. Kaolinite-oxides conglomerates: a. natural soil; b.
after a diffusion test in acidic environment. sediments were kindly bestowed by Dr. Dione Morita. 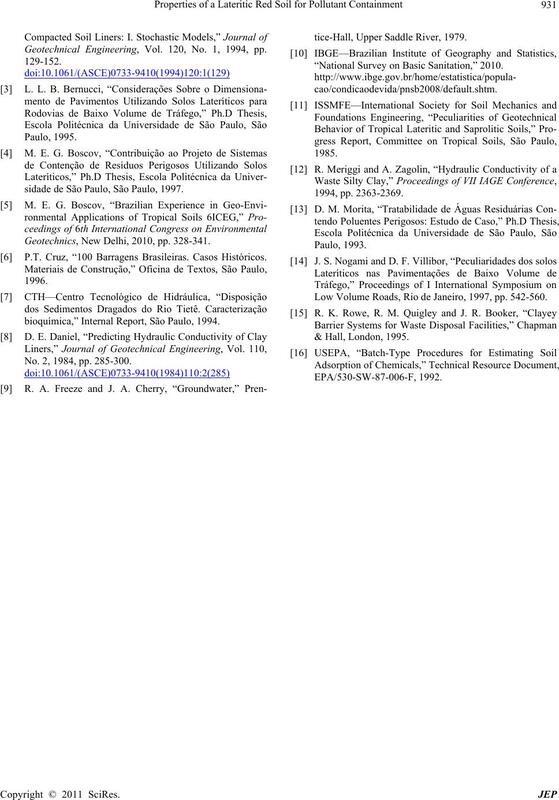 F. S. Barone, E. K. Yanful, R. M. Quigley and R. K.
nal, Vol. 26, No. 2, 1989, pp. 189-198. 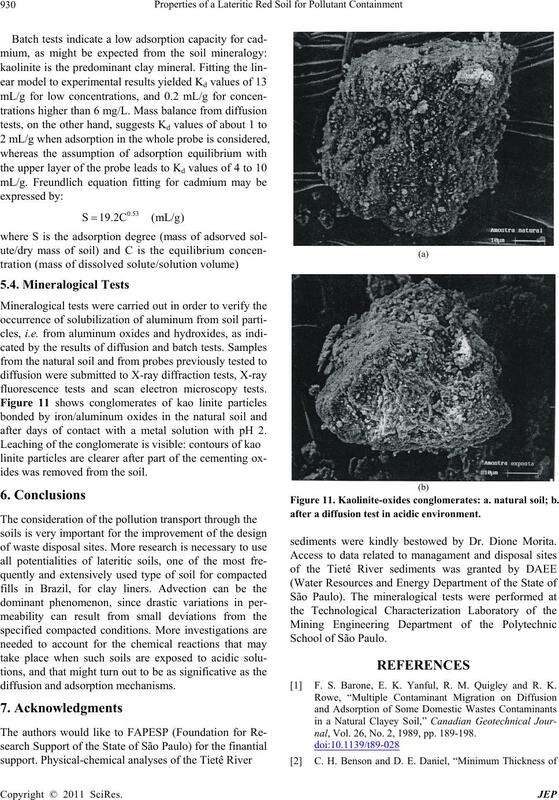 Geotechnical Engineering, Vol. 120, No. 1, 1994, pp. sidade de São Paulo, São Paulo, 1997. Geotechnics, New Delhi, 2010, pp. 328-341. P.T. Cruz, “100 Barragens Brasileiras. Casos Históricos. bioquímica,” Internal Report, São Paulo, 1994. No. 2, 1984, pp. 285-300.
tice-Hall, Upper Saddle River, 1979. “National Survey on Basic Sanitation,” 2010. Low Volume Roads, Rio de Janeiro, 1997, pp. 542-560.